If the elephant is poorly trained for footcare, do some training in five minutes steps some 5-10 times before, with a lot of rewarding. daily shower.Clean the elephant and the feet before. If the elephant is poorly trained trained, dont over do it. Make a lot of pauses. If the elephant is uncomfortable about keeping the foot on the tube, try to bring a used car tire between the tube and the foot. If you have limited experience, rather use the rasp than the knife, the first year! Work with sharp knifes. You have better control and you dont get tired so fast. Stainless steel knifes tend to be useless after 10 minutes, so buy the old type, with more iron, they may rust easier, but will remain sharp muche longer. Recommended: "The Knife". Rather than doing a lot at one time, try to work step by step and watch the results over some weeks or so. Normally, its easier to do the foot work some 10 minutes after the daily shower, Since the moisture makes the footsole softer. After slightly drying, the soles will be as soft as hard cheese, and easy to cut. If the elephants are not regulairly washed, its recomenede to put the foot in a footbath, soaking for some 10-15 minutes. Cutting hard, dry feet makes you fast tired, and its easier to do something to much or wrong, too much force makes you loose control. 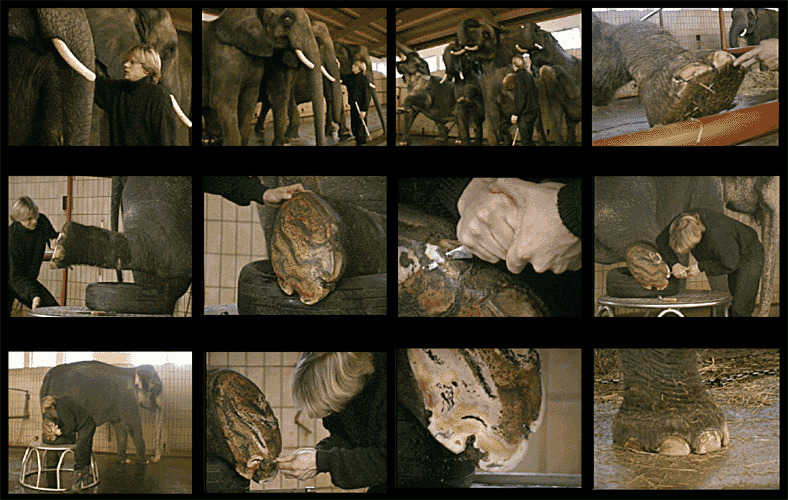 And apart from that, its easier to see what you do if the elephants are nicely cleaned. 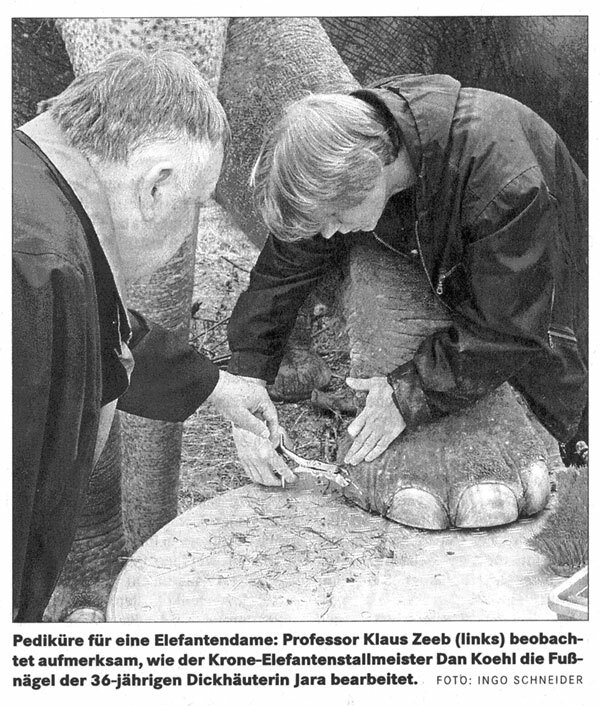 Elephant footcare at Circus Krone in Germany. Notice clean surrandings, the rubber Tire under the hind foot, and the elephants relaxed position. Larger picture Photo: Jan Lindblad Jr.
Papills on the base of the nail can carefully be shortened with an operation tang, and afterwards smeared with skin cream so it becames smooth and soft. The sole has to be opened so that the cracks sidewalls correspond with the sole, and the weight from above pressure down the centrum of the crack. This has to be made very carefully, because you might reach bloodflowing parts earlier as you expect. As long as the sole has a yellowish colour with a quality of hard cheese, theres minor risk, when it turns white and soft, you might find layers of bloodvessels, and you have to be careful there. The nails has to be shortened and rounded, in order to reduce the pressure of the weight on the tip of the nail. Normally, its enough to shorten the nail with a rasp. If the nail is very long the hoofknife can be used. Watch for cracks filled with dirt between the lamellas. If there are cracks try to cut them down a litlle bit. If possible, avoid rasping and polishing the frontpart of the nail. It will shine white and beautiful for some weeks, but the nail actually has lost its protection, and if its only kept clean it doesnt matter if its not shining white and bright. If the frontpart is not totally flat however, having minor cracks or rough surface, its good to carefully rasp it down, so dirt and bacterials have difficulties to fasten and develop.